So my little miss has been giving me all the love because I brought home a couple of ultra cool toys from some of our blog friends. Hands in the air if you’re okay with being the cool parent. I know I am. I’ll take my cool points wherever I can get ’em from, thank you very much. 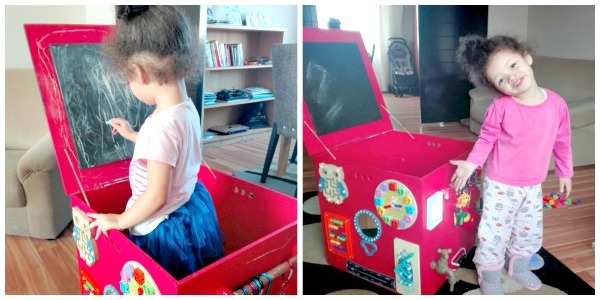 Anyways, so you know how I love to give kids educational toys as gifts? Well, the toys I’m going to chat about today tick all the right boxes AND they encourage imaginative play, which is always a winner in my books! Thanks to Sharon of Blessed Barrenness, I was introduced to An African Salad’s Busy Box. Guys, allow me to intricately paint a picture of how blown my mind was when I unboxed it. Wait, I can’t, because my mind was THAT blown. Exactly. Hubstopher and I unboxed the Busy Box when Kari was asleep and man, we could not stop touching everything. 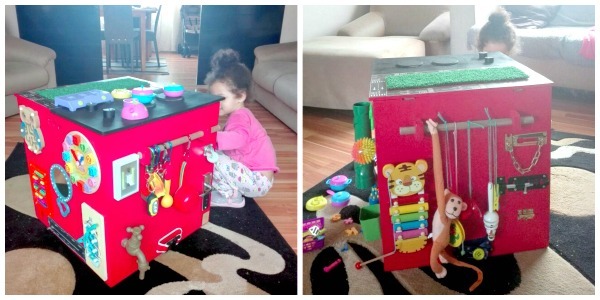 This wooden box (and it’s big yo) has an array of activity on all 4 sides. 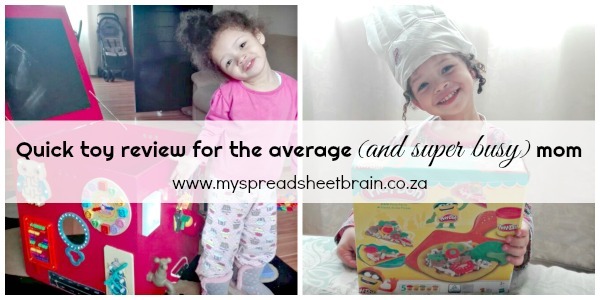 I’m talking gizmos and gadgets to help your little one learn fine motor skills, gross motor skills, how to count and tell time and helps to grow their investigative and problem solving skills. Legit. I love that they are able to custom make each box for you (I picked a red one because red is the color of my heart. (Awwww. But also, gross I know… I didn’t think that through before typing it.) And that’s not all folks, the top (lid) of the box can either be a really cool road, complete with grass and road markings. Or it can be a little kitchen, with a stove. The box contained plastic pots and pans (for the mini kitchen) and some chalk because the inside of the lid holds a chalk board! Like, hello, seriously?! Aaack! Needless to say, Kari was most impressed. And I went to bed wearing shades. Well, I didn’t. But I should have. I felt that awsome. An African Salad’s Busy Box retails for R2499 and would make a legit Christmas present, ya’ll. You can get more info from their Facebook page. As if that wasn’t enough, I had recently received a drop from Hasbro who launched their ultra cool Play-Doh Kitchen Creations range. (Yep, pretty much a super hero in my girls eyes) We got the Play-Doh Pizza Party set and Kari has spent an amazing amount of hours each day using the different colored play-doh to create her own pizza masterpieces. I joined her. While taking a nap. At the exact same time. Man, I love play-doh! But seriously though, I love watching her create and have little conversations with herself and her imaginery customers. And I love that it gives me a break from watching Frozen. Win-win. Her new fave thing to do is “play cooking”. 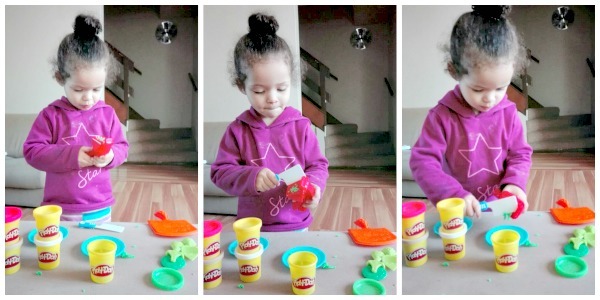 The Play-Doh Kitchen Creations range is perfect for her! Another top Christmas gift idea, for sure! By the way, yes, Christmas is a couple of weeks away. I’m considering starting super early with my Christmas gift buying. When do you start planning Christmas gifts?